To approach an ideal framework for designing a metal casting requires a detailed study of the contradictory requirements and identifying the best solutions. 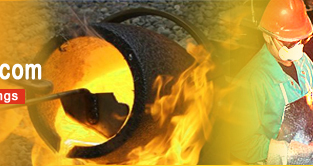 The designing, quality-benchmarking and cost-effective considerations play an important role to work out an ideal structure for metal casting. A clever designed casting is required to be competent on one hand and cost-effective on the other. However, this technique of designing and creating castings is a complex job. Several considerations are required to define while crafting a framework of the cast and surprisingly, there is no particular rule to distinguish them. Thus, it involves a thorough analysis of manufacturing ability and other production stages during the design phase of the metal casting. Here are some of the Special Patterns and devices which are both cost-effective and identify the best solutions. Mounted Pattern: When a pattern is mounted to a board to facilitate molding, it is called a mounted pattern. In this case the mount has on each end guides which match up with the flask used to make the mold. The plate is placed between the cope and drag flask, the drag rammed and rolled over. The cope is now rammed and lifted off. The plate with pattern attached lifted off of the drag half, the mold finished and closed. Sweep Pattern: A sweep pattern consists of a board having a profile of the desired mold, which when revolved around a suitable spindle or guide produces that mold. Two are usually required, one to sweep the cope profile and the other the drag profile. Skeleton Pattern: This is a frame work of wooden bars which represent the interior and exterior form and the metal thickness of the required casting. This type of pattern is only used for huge castings. Expendable Pattern: As in Lost Wax casting the pattern is lost. Expendable patterns for sand casting are Styrofoam which is shaped to the desired form with attached Styrofoam gates, runners and risers. The Styrofoam pattern is molded with dry clay-free sharp silica sand in a box or steel frame. 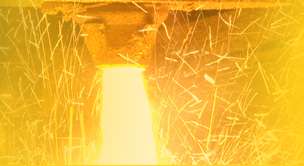 The pattern is vaporized by the metal poured into the mold, leaving the casting.